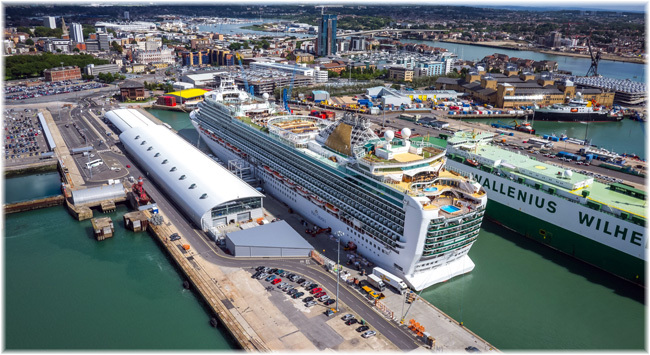 Construction work has begun to upgrade Ocean Cruise Terminal at the Port of Southampton, to support continued growth in the cruise sector. Representatives from ABP, Carnival UK and contractors, GRAHAM, came together to mark the start of main construction work for this major investment at Ocean Terminal. On the evening of August 10, 2018, Cunard’s three queens—Queen Mary 2, Queen Victoria and Queen Elizabeth—sailed from Southampton and were sent off by the Red Arrows, The Royal Air Force Aerobic Team with a display of a flying formation. Two million passengers visited Southampton in 2017 and brought with them a massive multi-million pound cash injection to the local economy. Every time a cruiseship visits Southampton, it is estimated to bring a cash boost of £2m (€2.26m) and in 2017 there were more than 500 calls.